een the Coliseum and the Vatican? Tired of ancient history? Looking for a more authentic, more contemporary experience? Walk the new Rome, without the tourists. Rome with the Romans. Following the success of their alternative guidebook, Rome the Second Time, authors Dianne Bennett and William Graebner offer four new Rome walks, all outside the city’s tourist core, all easily accessible by Metro or tram, and all in neighborhoods where Romans live and work. 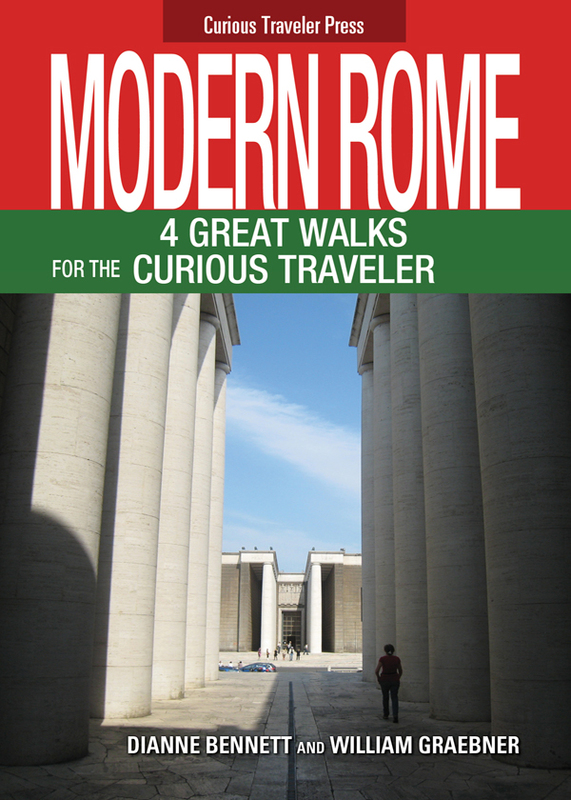 Modern Rome: 4 Great Walks for the Curious Traveler features more than 100 hyperlinks, 63 photos, and 4 detailed maps. “Garbatella—Garden City Suburb” is a guided tour through one of the world’s most engaging and mysterious planned communities, a 1920s creation featuring curving streets, enchanting stairways, interior courtyards, and some of the most unusual public housing ever built. “EUR: Mid-Century Spectacle” features a dramatic locale, now a center of Rome’s business community, but planned and constructed in monumental style to celebrate the 20th anniversary of the 1922 Fascist March on Rome. On the opposite end of the city, a walk through Flaminio introduces Rome’s sensational 21st-century, starchitect-designed cultural centers, and across the Tiber, the suggestive site of the 1960 Olympic Games, the Foro Italico, a virtual “Mussolini theme park” built by the Duce in the 1930s. A fourth, stairways walk begins in Trastevere’s back yard, winding up, down, and around Rome’s 8th hill, the Gianicolo, traversing a 17th-century villa, a compelling 1941 monument to the Italian unification movement, and one of the smallest and most charming temples in all of Italy. Pack your bags. Bring your curiosity. You can purchase the book online from Amazon or Smashwords in multiple eBook formats at https://www.smashwords.com/books/view/360910. eBook formatting and cover by Shelley Glasow Schadowsky.